Quicksand in the Slipsand Galaxy. Quicksand[page number needed] appears in a few games as a hazard. While it cannot hurt the player in most cases, it can send them into a pit or drown them. 1.5.2 Mario Kart: Double Dash!! Quicksand makes its first Mario-related appearance in Super Mario Bros. 2, where it appears in the desert levels. Some of it can be escaped by jumping repeatedly within it; others move faster and act more similar to waterfalls. The player must use log-like bones to travel across this type. Quicksand appears in Super Mario Bros. 3, primarily in World 2- . The player can sink into it, making moving and jumping more difficult, though continuously sinking causes the player to fall into a pit. Various types of quicksand appear in Super Mario 64, specifically in Shifting Sand Land. Most of it will pull Mario down to around the waist, and is a somewhat orange color in comparison to the more yellow regular sand; the dark brown quicksand around the Tox Box area and the Pyramid, however, will pull Mario down immediately. Large holes also appear in the sand, the middles of which will likewise pull Mario under immediately. All of these varieties return in the remake, Super Mario 64 DS; however, the mild type is now visually identical to the normal sand. Quicksand in New Super Mario Bros.
Quicksand reappears in New Super Mario Bros., behaving the same as Super Mario Bros. 3. Some quicksand in the game also leads the player to secret areas instead of leading to a pit. Quicksand appears in Super Mario Galaxy in the Dusty Dune Galaxy, Sand Spiral Galaxy, and Bowser's Galaxy Reactor, where the deadly type is marked with a skull sign, similar to poison. Milder versions also form rivers and other types of flows in the first of these, and can push Mario around. Quicksand returns in New Super Mario Bros. Wii, behaving exactly the same as in previous games. The player character is now completely visible in the quicksand, and performing Spin Jumps causes them to ascend higher through the quicksand. Quicksand appears in Super Mario Galaxy 2 in the Slipsand Galaxy, where it acts the same as the quicksand as in Super Mario Galaxy. A special craft called the Sand Sailer can travel over it. Quicksand reappears in New Super Mario Bros. 2, behaving the same as in past games. 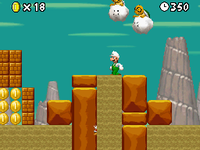 Quicksand is featured again in New Super Mario Bros. U and New Super Luigi U, behaving identical to previous games. The player character is now seen as a silhouette when traveling through quicksand, and sink noticeably faster. 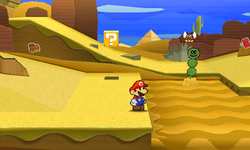 Quicksand also appears in Super Mario 3D World, behaving the same as in the predecessors. It is featured primarily in Conkdor Canyon. A single pool of quicksand appears in Super Mario Odyssey within Tostarena Ruins. It behaves the same as in previous games, though much slower than usual. It is dark brown and has a few craters in it. It also can be seen flowing down a river of it into the aforementioned pool. In Donkey Kong 64, quicksand appears in Angry Aztec, where it simply hurts the Kongs to touch it. Quicksand is featured in Mario Party 2 as the basis for the minigame Quicksand Cache. The Spiny Desert board in Mario Party 3 has two quicksand pits. If a player lands on one of the Happening Spaces surrounding the pits, that player and anyone else near that pit will be swallowed by the quicksand, which warps them to the other pit. Pyramid Park in Mario Party 7 has a board event that is nearly identical to the one from Spiny Desert. There is a quicksand pit on both the east and west sides of the board, each of which have three rock platforms standing over them. If a player lands on one of the Green Spaces above one of the quicksand pits, any players standing on the rock platforms above that pit will fall in and be warped near the other pit. In Wario Land 3, quicksand appears in the Desert Ruins during the day, and cannot be escaped through jumping. The only way out is by taking a path to the side at the bottom. Sand Hands try to reach onto the platforms above to pull Wario in. At night, the quicksand is still, and functions as an empty space, meaning Wario will simply fall through. Quicksand first appears in the Mario Kart series in Mario Kart: Super Circuit, where pools of quicksand are found on the sides of the Yoshi Desert course as obstacles. These pits of quicksand have Piranha Plants in them that will eat any racer that falls in. A large pool of quicksand appears in the Dry Dry Desert course in Mario Kart: Double Dash!! Similarly to Mario Kart: Super Circuit, a large Pit Plant eats any racer that falls in and Lakitu will have to rescue them. In Mario Kart 8 and Mario Kart 8 Deluxe, GCN Dry Dry Desert returns as a retro course, and thus the large pit of quicksand also returns. However, the Pit Plant is absent at the bottom of this version and Lakitu will instead save the player instantly. In Super Paper Mario, quicksand appears in Yold Desert and Yold Ruins. Sinking into it results in the player losing 1 HP. In Paper Mario: Sticker Star, quicksand appears in Drybake Desert. Completely sinking into it results in a Game Over. In Paper Mario: Color Splash, quicksand appears in Mustard Café, where wading through it causes some Pokeys to chase Mario. Like with Paper Mario: Sticker Star, sinking into it results in a Game Over.